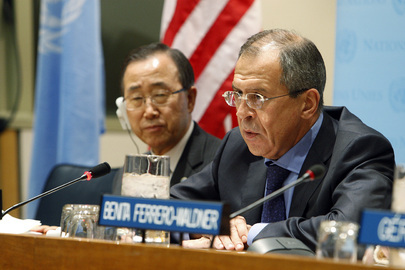 UNITED NATIONS, May 11, updated -- Amidst carnage in Sri Lanka, foreign ministers meet Monday at the UN in New York on a bland Presidential Statement on the Middle East. As the text was negotiated last week, references to settlements and terrorism were dropped from the draft, the “blue” version of which Inner City Press is putting online here. The 15 member states will speak, and then Russian Foreign Minister Sergey Lavrov will hold a press conference at 12:30. Lavrov emerged at 9:40 from the Security Council accompanied by the highest Russian UN official in New York, Dmitri Titov. They entered an elevator to go meet with Secretary General Ban Ki-moon. Inner City Press' reporting in recent weeks finds that Lavrov has twice urged Ban to hire more Russian, particularly in top envoy posts like the Niger mission of Robert Fowler, which ended in kidnapping and prisoner swap. To some, the open involvement of UN official like Titov in the visit to the UN of a dignitary of “his” country is questionable. It would be like Sir John Holmes, the UN's top humanitarian, openly squiring UK minister David Miliband around, or top peacekeeper Alain Le Roy accompanying Bernard Kouchner. A Security Council staffer told Inner City Press that with Le Roy and Susana Malcorra out of town, Titov was by coincidence the peacekeeping Officer in Charge. Did he go up to speak of Georgia? The foreign ministers attending, in the order they will speak, include Austria's Michael Spindelegger, Burkina Faso's Bedouma Alain Yoda, Turkey's Ahmet Davutoglu, France's Bernard Kouchner, Mexico's Patricia Espinosa Cantellana, the UK's David Miliband, Costa Rica's Bruno Stagno and Russia's Sergey Lavrov. Kouchner swept up the escalator with Jean-Maurice Ripert; Miliband with John Sawers. Both are slated to speak at 1 p.m. about the situation in Sri Lanka, where hundreds were killed over the weekend. Watch this space. Update of 10:26 a.m. -- walking into the Security Council at 10:25 was Titov's boss, Alain Le Roy. Inner City Press asked him, staff said you were away, and Titov standing in for you. No, Le Roy said, Titov was not in the meeting with Ban. So he squired Lavrov to and into the elevator? Update of 11:41 a.m. -- click here for Sri Lanka story, Inner City Press' questions to UK's Miliband. On the Middle East, a prominent OIC Ambassador told Inner City Press that Russia's PRST is very weak, it would have been better to pass nothing, it is intended to publicize a Moscow event "that will never happen."